After a short respite, this weekend has seen the Gallente militia war machine back in high gear, turning Kinakka and Asakai into charnel houses. As it was in Okkamon and so many key systems before it, the stars were choked out by the charred husks of destroyed ships, numbering in the thousands. These systems represent the final stages of an offensive that has been going on since early 2014, and some of the last nails in the coffin of Caldari State Protectorate presence in the war zone. Only a handful of systems in the south remain in Caldari hands, but brutal logic demands that State control is not long for this world. After four days of fighting in Kinakka, and Asakai directly after, 4700+ ships and 600+ pods had been lost, costing somewhere in region of 85 billion ISK. 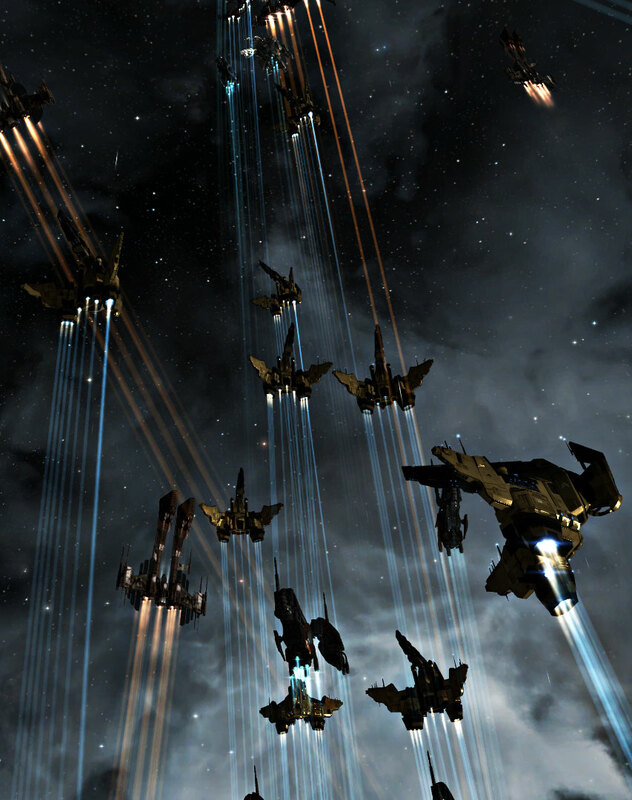 Of the nearly two thousand players who participated, the majority were Gallente and Caldari militia, as well as contingents from the Minmatar. Meanwhile, “honourable” third parties such as WAFFLES. contributed to the carnage. The life of an EVE writer is not always so glamorous as some people seem to think. You spend a lot of time writing about New Eden rather than actually playing the damn game. In fact, given the hours invested, even for those that do get paid, it is probably the worst ISK/hour ‘in’ EVE. As the editor-in-chief of Crossing Zebras I literally spend more time writing, editing and talking about EVE than I do playing it. Sometimes I just have to let go of the work and get dirty even though I have things to do. Not only so I know what I’m talking about but, well, because I love playing EVE and I need that motivation battery recharged to stave off burnout. So for a while I close all those conversations, submitted articles, e-mail clients and statistics feeds that, more often than not, clutter both my screens and demand constant attention. On Thursday last week the main contingent of the Gallente Militia moved on Kinakka, a Caldari system and the long-time home of WAFFLES. I joined the fighting on Friday, staying up much later than was healthy, and had one of those nights you don’t want to end. And then it happened again, in Asakai. Contrary to null, FW ‘sov’ is associated with fun and action, with people flocking to take part. Both Kinakka and Asakai really drove that point home, once again. As I logged in on Friday evening, small scale plexing operations had already been going for 24 hours. As the evening drew on the assault was launched in earnest however, and I was lucky enough to take part when the fighting was most fierce. The fleet stayed up while rotating FCs and members, but remained focused and stuck to the plan. Given that our only focus was taking the system, we mostly stuck to Harpys, Enyos, Merlins, Tristans and support craft during my time in fleet. The Caldari similarly fielded smaller ships and we fought like there was no tomorrow at the plexes. Meanwhile, a cruiser NPSI fleet and other opportunists were roaming about the system, looking for stragglers and waiting for FCs to make mistakes. Some squids had taken to camping the Innia / Kinakka gate, catching solitary pilots that had reshipped in Innia. To the credit of the Caldari I must say that they took the fight, over and over again. Every time we had obliterated their fleet it was not long before our scout would warn over comms: “Check, check, they’re undocking again.” It is testament to the ‘true’ CalMil who fight tooth and nail over every percent of the contested state, and are as such worthy of respect. Besides the cyclic slaughter of Caldari, two moments have stayed with me from that night. The first was an engagement against WAFFLES’ Wolf fleet. In GMVA we had fought this fleet before, in our cockbag Thrashers, and won in spectacular fashion. This time the mixed GalMil fleet, commanded by one of our leading FCs, engaged them and the Caldari in a mix of Harpies, Enyos and support. While we lost a handful of ships, the Caldari were pushed off the field and WAFFLES obliterated (although they would have the last laugh, read on). The key, as always, was crisp target calling, broadcast to fleet and focused down with discipline. In the middle of the fight one of our scouts reported that the NPSI cruiser fleet was headed to the plex where we were engaged, but by that time we were committed. The price was a few assault frigates and some support craft, but the prize was well worth it. Squid on waffles tastes pretty good, as it turns out. The second moment is a later engagement where we had shipped down to Merlins in anticipation of novice and small plexes that were about to spawn. As it turned out, and because we had grown bold and cocky, we ended up engaging the Caldari in the large plex that was still active in the system. In our eagerness to fight we had made a fundamental mistake however: most of our Merlins were fit with afterburners and intended to hold plexes we had occupied, while the Caldari were flying Coraxes at the time – ideal for taking out slow frigates at range. Landing some 60 km from the enemy, we saw the familiar drop-like shape of the squid fleet as they had anchored on their FC and moved – exactly what you’re supposed to do with a fleet of Coraxes. Our own fleet broke apart somewhat as those few that did have MWDs fit tried to catch the enemy anchor ship. Had the Caldari executed properly we would have all died in a fire. Unfortunately for them they did not maintain range and focus down the incoming tackle, and their movement became disarrayed, allowing our slow Merlins to land on targets and rip them apart. What should have been a clear advantage for the Corax fleet ended in us holding the field with only marginal losses. We took the system without incident just after downtime. Meanwhile a contingent consisting of the newly joined Bohica Empira had proven their worth with operations in Pavanakka – a Caldari staging system – and it too fell into Gallente hands hours later. To a see a detailed report on the fighting in Kinakka, click here. Asakai would be the next target, but I was busy and unable to steal some in-client time until Monday. I joined the main operational fleet at around 21:00 EVE time, being told that Asakai was on fire. The first thing I heard on comms was the FC and others cursing WAFFLES. I had obviously just missed something and proceeded to ask what had happened, once the chatter had died down a bit. I was informed that we had been on the IHub, pattig each other’s backs over a successful campaign, when WAFFLES had returned and ruined the party – effectively sending us plexing again. Remember how I said they would have the last laugh? Well, this was it. CalMil had also grown in number and the fleet hadn’t been having a good time of it. But things were about to change. As EUTZ met USTZ the fleet swelled to ~80 pilots and we were able to take command of the situation again. Undocking a strict Merlin and support doctrine we set about running the plexes in force. Yet again the Caldari came to fight, and died by the dozens every time they undocked. Meanwhile pirates and neutrals had their pick of targets. As the night drew on we switched to Harpies, Enyos and support to cement the last stages of taking the system to vulnerable. 2300+ ships were lost in Asakai, but only 17.5% of the ISK loss had been Gallente or Minmatar. The main reason for this was participation from all corners of GalMil and FCs willing and able to step up for the whole operation. Along with the usual suspects like C.Q.B, Justified Chaos and Villore Accords, amongst others, Bohica Empire once again proved themselves by participating, as well as Aideron Robotics, who had come up from the south. It was one of those moments where we weren’t this or that alliance, this or that corp, we were simply: GalMil. At 01:11 the system was ours. 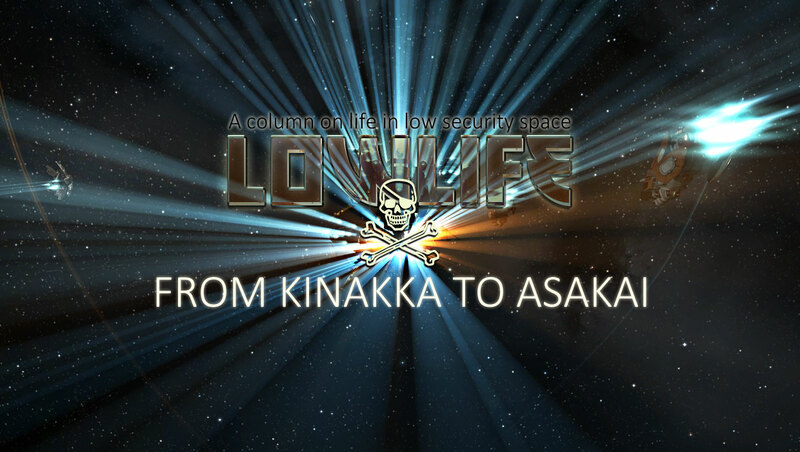 To see a detailed report on the fighting in Asakai, click here. It is a grand feeling being part of something larger than yourself. Every time events like these happen I get a taste of that. In those moments I can understand the motivation of those that spend their days in null, building empires, toiling on as a cog in a greater machine, able to demand its mark on the world. The other side of that coin is that in this campaign I was little more than an extension of the FC and a statistic. It’s the only way these things get done. Unless I have something crucial to say I keep my mouth shut on comms, if I die I do so in silence, when I reship I undock according to doctrine, and when I leave I simply put “-1” in fleet chat. There is no room for personalities in fleets like these, you’re part of the team or you’re out. I respect that, I understand that, and I’m proud to be a part of it, but I need to put ‘me’ aside when duty calls. That’s why glad I’m in GalMil and live in lowsec, because I know that in between these focused campaigns I get to be ‘somebody’. I fly with people I know well and the narrative takes on a much more personal character. In many ways I live a charmed life in EVE. I am both an F1 monkey – part of something amazing and recognised, as well as someone’s wingman and friend – connecting on a personal level. In lowsec there is content for both, and that, I am thankful for.